In the tiny town of Rindal in Fjord Norway, one hundred volunteers are running a ski museum of international renown. When the European Museum Forum recently announced their nominees for the prestigous European Museum of the Year Award 2017, there was one Norwegian museum amongst them. 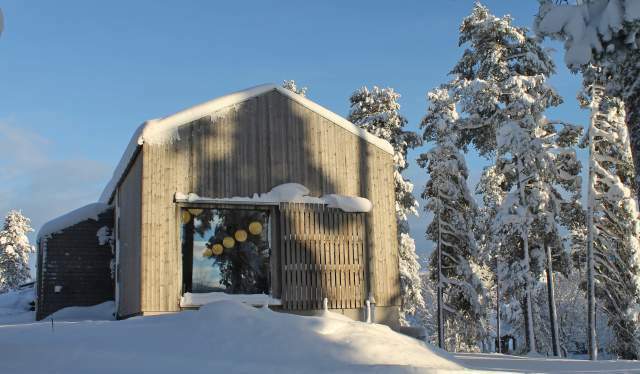 Rindal Ski Museum, part of the Nordmøre Museum foundation, was found by the jury to be amongst the institutions that in recent times have shown “enterprise and innovation that enhances the public quality of the museum”. “Getting a visit from the jury was exciting enough. And now we’ve actually been nominated”, says museum head Kari-Elin Bolme Løfaldli. Should the museum take home the award, it would Norway’s second win. Back in 1993, Alta Museum (which is on the UNESCO World Heritage List) got the award for their preservation of rock carvings and paintings that date back between 2,000 and 6,200 years. Rindal Ski Museum opened in 2014 in a revitalized barn house from 1780. The use of the barn house may be partly why they were nominated, but Løfaldli also believes the nomination is due to the way the museum is run. Their exhibition largely centers around wooden skis and the stories behind them. Rindal has been home to four different ski factories, Landsem being the most famous brand. However, the story dates back much further. “In old times, skis were a necessity both for travelling to see your neighbours and for going out hunting or fishing. Skis were made on every farm, and the people of Rindal got quite good at making them. Particularily when the skiers also got good”, Løfaldli says. If you have any interest in competitive skiing, know that Rindal has played an essential part in the sport. At the first world championship in Chamonix featuring nordic skiing (cross-country skiing, skijumping and Nordic combined), Rindal native Sigurd Røen took home two gold medals – for Nordic combined and as part of the team that won the 4x10 kilometre relay. Later, Rindal skimakers provided many of the winning skis used in international competitions by athletes from all around Norway. Many of these are now exhibited at the museum, along with Røens gold medal. Along with the skis, you can also find the machinery that produced them. In addition to retelling skiing history through their unique perspective, the museum offers videos and digital experiences showcasing how the machines work, typical ski wear from different eras, how ski tracks were made and clips from great championships throughout the ages. “That way, we create a lively and exciting museum experience”, Løfaldli says. Rindal Ski Museum is located in the center of Rindal. The museum is open all year, but during winter time you need to book your visit in advance.